Scheduled colour television broadcasts did not arrive in Britain until 1967, but work had been going on to create colour TV since the late 1920s. Once again, John Logie Baird was the innovator, demonstrating colour television with rotating discs and a colour wheel to a British Association meeting in Glasgow as early as 1928. A decade later, he demonstrated large-screen colour TV in London, and the following year visitors to the Radio Show experienced 'high definition' (i.e. higher definition than the existing 405-line monochrome system used by the BBC Television Service since 1936) 600-line colour transmitted from Baird 's remaining test facility adjacent to the ruins of the Crystal Palace , destroyed by fire along with his extensive TV studios in 1936. Baird 's work may have given Peter Goldmark in the United States the inspiration to design the CBS colour system, which also featured a rotating colour wheel coupled with electronic scanning. However, while Baird was undoubtedly the father of television, the poor reliability of his rotating discs and mirrors meant that his systems ultimately proved impractical for broadcasting and for use in the home, although his flying spot scanner formed the basis of the primary method of televising film for years, and rotating mirror drums scanning and colour wheels have had application in certain types of space probe cameras. It was not until 1955 that the BBC began to experiment with colour television and test transmissions began, using a version of America's now-standard NTSC system, modified for 405-line, 50Hz operation. Tests were broadcast from the Alexandra Palace transmitter in North London, the original home of the BBC Television Service , after hours from 10 October 1955, and then, late the following year, from the new Crystal Palace BBC transmitter before it came into service. Nobody other than the few engineers and manufacturers who were involved in the tests would have seen these transmissions in colour; the public would have seen them, and their rather low-key test card, in black and white. There were also doubts about introducing a colour 405-line VHF service when much of the rest of Europe was already considering a higher definition UHF standard. In 1953, top designer Abram Games had devised the world's first animated TV ident, the 'BBC Television Symbol', with its eye, rotating rings and lightning flashes - referred to by modern television enthusiasts (but never at the time) as the 'bat's wings'. Games later produced a related tuning signal - similarly referred to as the 'angel's wings' - that was in use from 1956, and a special colour version of this was produced for the tests in 1957, featuring coloured panels on the 'wings' and a picture at the centre of BBC announcer Sylvia Peters. In the same year, the BBC expanded its programme of colour tests, still using NTSC, to UHF. The relatively new commercial television network was also interested in colour, and carried out its own tests. In 1960, ABC Television, serving the Midlands and the North at weekends, experimented not only with the French colour system, SECAM (a sequential-frame system that conceptually had quite a lot in common with Goldmark's CBS colour system but was all-electronic), but also with NTSC. May 1960 saw Parliament's Television Advisory Committee recommend the introduction of colour TV, specifying that it should be backwards compatible with monochrome broadcasts: in other words, viewers of a colour broadcast on a black and white set should see a reasonable picture. However, the standards for colour TV were still up in the air and the Committee recommended that introduction should wait until the standards issue had been settled. At the beginning of June 1962, the Pilkington Committee's report recommended that colour TV should only be broadcast on UHF with the new 625-line UHF specification, following the allocation of Europe-wide UHF channels the previous year, but still left the standards issue undecided. Accordingly, in the same month the BBC began colour test transmissions, still in modified NTSC, in 625-line on UHF, along with monochrome 625-line tests for the forthcoming BBC 2 service on channels 33 and 34. They also carried out SECAM tests the following spring, and it was evident that there was still no agreement on standards for British colour. Meanwhile, the GPO carried out colour link tests via the Telstar 1 satellite - tests that were easily picked up in the US and thus constituted the first transatlantic colour television linkups. The next era of British television began officially with the (monochrome) opening of BBC 2 on the evening of 20 April 1964 - although opening night was ruined by a major power failure. ITV and radio, along with the BBC 's news facility at Alexandra Palace were unaffected, and London weekday independent contractor Rediffusion offered to transmit the new channel's opening programmes, though it proved impossible to link the systems together in time. BBC 1 continued by broadcasting from Alexandra Palace, but instead of the new channel's planned opening night, newsreader Gerald Priestland appeared from the Ally Pally newsroom, initially without sound, and explained what had happened. The evening continued with a programme of music and apologies until a further news bulletin at 10pm and closedown. The next day, with emergency generators on standby, the programme Play School , broadcast as scheduled at 11am, unexpectedly became the first programme from BBC 2. That evening the channel showed the items planned for the opening night, which this time went without a hitch, opening with a memorable moment when announcer Denis Tuohy blew out a candle symbolising the previous night's events. To apparently add to the confusion but ultimately to settle it, the previous year had seen the announcement from Germany of the new PAL (Phase Alternate Line) colour TV system. This built on the structure of the existing American colour standard but fixed several of the problems that dogged the US system in a broadcast environment. While NTSC worked quite well over wires in the TV studio, once it was radiated from a transmitter, multipath reflections and other problems caused all kinds of colour shifts, as had been noted years before in the US FCC hearings. Indeed, television engineers referred to 'NTSC' as 'Never Twice the Same Colour' (while the radically different French SECAM system was dubbed 'System Essentially Contrary to the American Method'). PAL fixed the main colour stability issue by changing the phase of the colour subcarrier every line, largely cancelling out colour errors - curiously enough a modification that had been proposed before the NTSC system was finalised, but never implemented. It looked great - 'Perfection At Last'. The BBC 's experimental UHF NTSC tests ceased, to be replaced by PAL tests beginning in the afternoon trade tests from 26 May 1965, and the decision to use PAL for British colour television was taken the following year. The independent television companies had also been working away, with ATV having begun colour experiments towards the end of 1962. The ITV companies, seeing the importance of colour (several were looking at adding colour production capability, if only for the US market) but not relishing the additional transmitter rental charges on a whole new set of UHF transmitters - which would have to be far more numerous to cover the population than the relatively long-range VHF network - advocated operating an ITV 405-line VHF colour service in parallel with the BBC 's second channel UHF service, an option that would have made dual-standard sets even more complicated than they already were. ABC was perhaps the most advanced in terms of colour equipment, and as late as 1965 it was demonstrating 405-line VHF colour to the Press Association. ATV began colour production in earnest in 1965, while Television Wales and West (TWW) , ABC and Rediffusion made some of their last productions in colour in 1967 before losing their franchises. BBC2 began a limited, but scheduled, colour service on 1 July 1967, with transmissions live from Wimbledon (a favourite for BBC OB test transmissions of new technology), preceded for a few weeks by colour broadcasting of certain shows and, of course, colour Trade Test films and the famous Test Card F with its centre photo of Carol Hersee, the daughter of the engineer who designed it. Initially the service covered London, southern England, the midlands and the north. Due to the lack of colour production facilities, the majority of early colour programming consisted of outside broadcasts and movies until the conversion of Television Centre studios 6 and 8, but by the end of 1967 BBC2 colour broadcasting had extended into the South West and South Wales, southeast and eastern England, and by early December the channel was broadcasting over three quarters of its schedule in colour. After the first year of a full colour schedule from BBC2 , there were over 100,000 colour sets in Britain. The government announced in May 1969 that colour transmissions from ITV and BBC 1 would begin on 15 November, and two months later British audiences saw colour television pictures from the Apollo 11 spacecraft on its way to the moon - interestingly, the camera used for these shots used a spinning colour wheel. 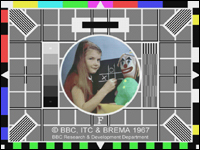 In September and October respectively, ITV and BBC 1 started colour test transmissions from the Crystal Palace tower, their first UHF broadcasts, ITV showing some of their regular programmes but transmitting the test card in place of commercials. When ITV and BBC1 launched on Saturday 15 November, their signals were receivable by about half the UK population, in the LWT / Thames , ATV , Granada and Yorkshire TV regions. By the end of 1969, the number of colour sets in use had doubled to 200,000 and within five years colour sets were outselling black and white. It was not until January 1985, however, that the last VHF 405-line monochrome transmitter went off the air.